Camping is fun and there is lots of equipment to buy, especially when you first get started. After awhile, though, some people like to buy fun accessories to express their own, unique, camping personality. It’s fun for us to see the variety of choices people choose to strut their stuff. 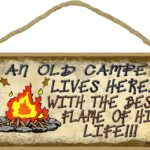 We’re sharing a few items with you to give you ideas and get you started making your camping home even more perfect for you. An Old Camper Lives Here sign for your RV. This one is fun and will get a laugh out of your friends who come to visit. Perfect for adding a little personality to your rig. 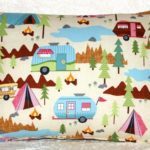 RV Camping Throw Pillow. This is bright and happy looking. 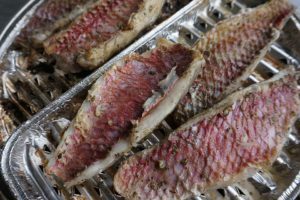 It would look sweet in your RV. It is handmade once you order so can take a week or so before it ships. Be aware this is only the throw pillow cover, however, the pillow form is not included. 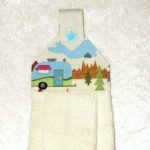 RV Camping Hand Towel. These are handy to have with their matching design and tabs to loop through the handles of your cabinets. Also handmade, they are unique and you won’t see them in many places online. 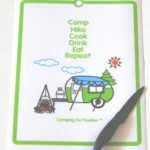 Camping for Foodies Cutting Mat. This is handy in the kitchen as well as adorable. It’s flexible and can be cleaned with hot soapy water. It can be hung on a hook or stored flat between other items on the counter. Pretty cute! 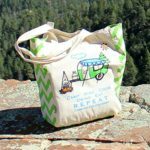 Camping for Foodies Reusable Grocery Bag. Forget those store stamped bags. These will make a statement as you shop. They are eco friendly and have a pen loop, too. 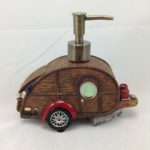 Teardrop Camper Trailer Soap Dispenser. Look how cute this retro teardrop camper is for holding your liquid soap. Purchasers say it fits well in the RV holds lots of soap. 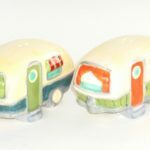 RV Salt and Pepper Shakers. They even have striped awnings painted on them. There are rubber stoppers on the bottom side and they are about two inches high and three inches long. They’d make a perfect gift for just about any camper on your list. Camping Wine Glasses. 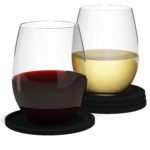 They won’t break and they come with coasters. They are BPA free, lightweight, and durable. No more worrying about having glass around the campsite. 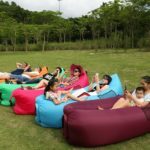 Polan Inflatable Lounger. You’ve probably seen videos of this on Facebook. You can now order them for yourself. They are so simple to inflate, you just open them up and scoop them into the breeze. They fill with air and become a unique place to sit or lay. When you’re done they roll up into a very small bundle. Emoticon Drawstring Backpacks.The kids would love these and it would be easy to keep track of which backpack belongs to which child. They are great for camping. You can pack each child’s belongings in their backpack and they just might enjoy helping with that.